The Robert A. Dennis, Jr. (RAD) Reentry Court program involves a unique, court-sanctioned approach to supervision either during a term of probation, or, more often, following an individual’s release from prison. In March of 2010 the United States District Court implemented a Reentry program, available for eligible individuals during a term of probation or more often following their release from prison. The Reentry program involves a unique, court-sanctioned approach to supervision either during a term of probation, or, more often, following an individual’s release from prison. To be eligible for the court’s Reentry program, a person must have a minimum of 36 months of supervision remaining (most have much longer). Individuals interested in participating in the program are selected and approved through a formal court referral and screening process. 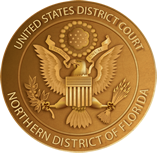 Once accepted into the program, the Reentry participant is subject to a more intensive level of supervision, lasting a minimum of 12 months and consisting of regular interaction with probation and monthly meetings withthe court team, including the judge, an assistant U.S. Attorney, assistant Federal Defender, and U.S. probation officers. The program is limited to ten participants at a time; however, each participant is on an individual track for graduation. In order to successfully complete the program and graduate, a participant must positively contribute to the group and maintain a drug, alcohol and crime free lifestyle for 12 months. Successful completion of the program entitles a participant to a one year reduction in the term of his/her supervised release. However, graduation from the program will never result in the end of a participant’s term of court supervision; all graduates will continue on regular supervision for a minimum of six months following graduation from the program (most much longer). (3) encouraging each participant to contribute to the community by actively developing and maintaining productive, law abiding lifestyles - including making better choices regarding associates, avoiding negative environments and providing for his/her family. We assist participants in reaching their goals by introducing needed resources in the areas of housing, employment, and mental and medical health. We also seek to identify skills and build strong character traits that will help participants make positive, life-long changes. Our reward and sanction system is designed to produce positive, evidence-based results. No reentry events are currently scheduled.